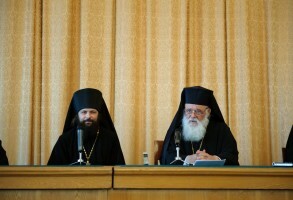 The first visit of His Beatitude, Archbishop Ieronymos of Athens and All Greece, to the Russian Orthodox Church took place from May 23 to 30, 2012. 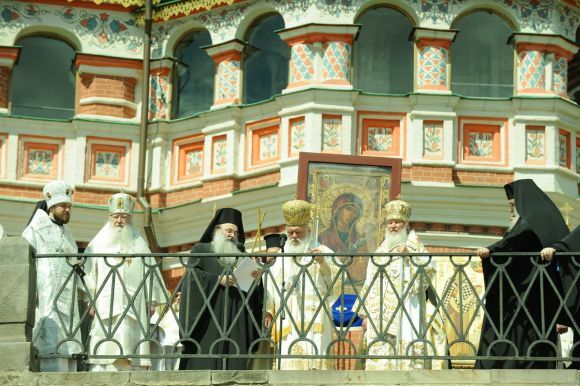 During the course of his official visit, Archbishop Ieronymos concelebrated the Divine Liturgy on the Feast of the Lord’s Ascension with His Holiness, Patriarch Kirill of Moscow and All Russia, in the Dormition Cathedral in the Kremlin. He also participated in the opening ceremony of the Days of Slavic Literature and Culture and attended a festive concert at the Cathedral of Christ the Savior’s Hall of Church Councils. On May 24, 2012, His Holiness, Patriarch Kirill of Moscow and All Russia, and His Beatitude, Archbishop Ieronymos of Athens and All Greece, met with the Russian President Vladimir Putin in the Throne Hall of the Cathedral of Christ the Savior. 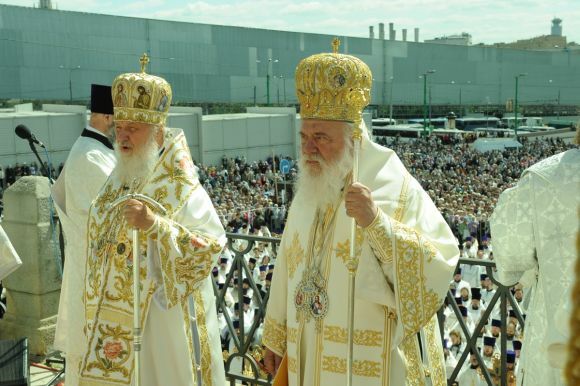 The Russian head of state greeted His Beatitude, Archbishop Ieronymos, saying: “I thank you for having found the time to come today, when we celebrate the name-day of our Patriarch and the Day of Slavic Literature and Culture. 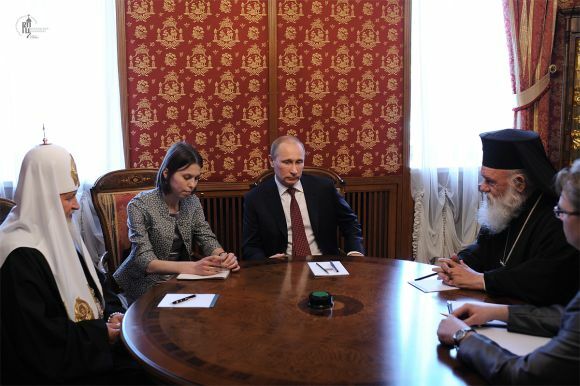 On such a day it is especially evident that we are united by deep spiritual roots.” President Putin expressed his confidence that the Primate would enjoy his stay in Russia. During his visit to St. Petersburg, His Beatitude and those with him visited the St. Petersburg Theological Academy and Seminary. The Rector, Bishop Ambrose of Gatchina, welcomed His Beatitude at the entrance to the Academy along with teachers and students. His Beatitude viewed the Chapel of St. John the Theologian, where he venerated the Tsarskoe Selo Icon of the Sign. On May 29, 2012, the delegation from the Church of Greece visited the Trinity-Sergius Lavra, the Moscow Theological Academy and Seminary, and the Sofrino church goods company. His Beatitude and those with him venerated the relics of St. Sergius in the Trinity Cathedral of the Trinity and then proceeded to the Dormition Cathedral. Archbishop Feognost of Sergiev Posad, Deputy Abbot of the Lavra, greeted Archbishop Ieronymos on behalf of the monastic brotherhood to thank him for his visit. 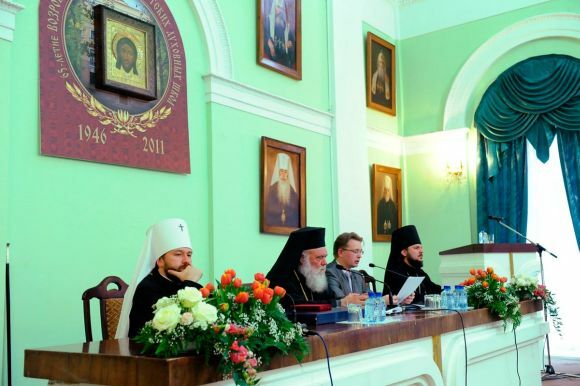 The delegation visited the Moscow Theological Academy and Seminary, the oldest educational institution in Russia. Archbishop Evgeny of Vereya, Rector of the theological schools, greeted the guests. His Beatitude addressed the faculty and students. Following a long and interesting talk, he responded to many questions.